Yesterday I started cutting out strips of fabric with a vague picture in my mind of how my dress would look. Sadie helped me drape and giggle. She also offered to sew, but I declined (by pointing out that we still need to buy batteries!). Here's what I've come up with so far. I'd have to say my dress form comes in a close second to my scissors in the usefulness department. 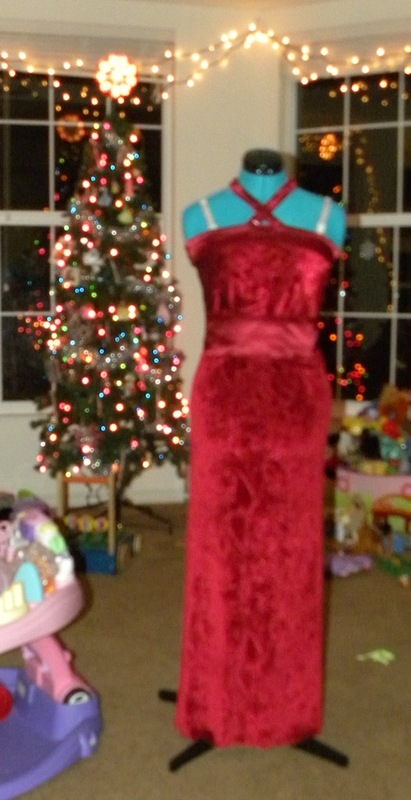 Unfortunately the bra straps (that I use to shape my dress form) are in the picture. But other than that, here's my plan for my new dress. Now if only I had someplace fancy to wear it! Maybe next year! Great job. And good thinking with the bra. You might want to try draping a skirt on the bias, diagonally. It'll have more drape and movement, but on the downside uses a lot more fabric. If you can find this book at a used book store or at a yard sale or something, pick it up! I took a draping class and we used this book. It's very easy to use and extremely informative. It also teaches you to make nearly any shape with the modern dress form. Unless it is a winter material? I dont know such things.